Made from a 100% cotton this adorable Nautical Dress is a perfect design for summer days out. The stripy bodice has an authentic collar complete with anchor buttons on the corners a toggle neck. 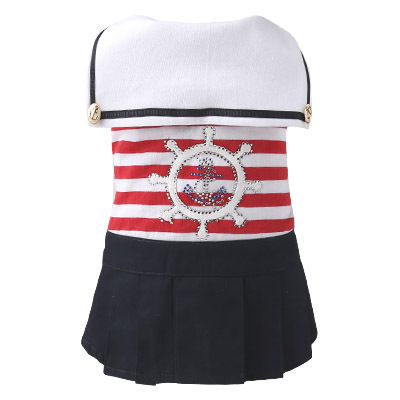 The back is decorated in a ship's wheel with clever use of crystals with a cute anchor in the middle. Finished off with an adorable denim style pleated skirt. Available in sizes S SM M L XL. Tracking may not be available in rare cases.